Benjamin Netanyahu (born October 21, 1949) is the conservative Prime Minister of Israel, who in 1997 negotiated a partial withdrawal by Israeli settlers from Hebron, which is on the West Bank. He is the first Prime Minister to be born after the official re-establishment of Israel as a sovereign nation. His brother, Yonatan, was killed in 1976. Yonatan was the field commander of the raid on Entebbe, an operation to free hostages of an Air France flight highjacked by Islamists. He was the only Israeli commando casualty of the operation. Raised in Jerusalem, Benjamin Netanyahu received his high school education in the United States when he moved with his parents to Cheltenham, Pennsylvania, a suburb of Philadelphia. To this day Prime Minister Netanyahu speaks fluent English with a Philadelphia American accent. Even as an adult, he is often referred to as his boyhood nickname "Bibi". Additionally, Netanyahu's father was a professor of Jewish history at Cornell University. He returned to Israel in 1967 and enlisted in the Israeli Defense Forces and participated in the Yom Kippur War, where he reached the rank of captain. Netanyahu would go on to continue to live in the United States when he received a bachelor's degree in architecture from the Massachusetts Institute of Technology in 1975, a master's degree in business management from MIT, and would go on to study political science at MIT and Harvard University. Netanyahu joined Boston Consulting Group, an international business consulting firm and later senior management of Rim Industries in Jerusalem. In 1979 and 1984 Mr. Netanyahu initiated two international conferences that emphasized the need to fight against terrorist organizations and regimes that provide them support. Members included Vice President George H.W. Bush and Secretary of State George Shultz. After serving as deputy chief of mission at the Israeli Embassy in Washington, DC., he was appointed Israel's ambassador to the United Nations. During his tenure he fought for the declassification of the United Nations archives on crimes committed by Nazi Germany. In 1988, Netanyahu returned to Israel and was elected as a member of the Knesset, the legislator of Israel. During the 1991 Persian Gulf War Netanyahu was a member of the Israeli delegation to the Madrid Peace Conference, which was the first direct negotiations between Israel and Syria, Lebanon, and a joint Jordanian-Palestinian delegation. In 1993, Netanyahu became chairman of the right-of-center Likud party. He was elected Israel's 9th Prime Minister in 1996 and sworn in after the approval of the Knesset. During his three-year term, the number of terror attacks in Israel drastically decreased. On economics, he governed as a free-market conservative, accelerated privatization of government-owned companies and reduced the budget deficit. By the time of Netanyahu's reelection he had alienated the political left, while also the political right for his negotiations with Yasser Arafat and the Palestinians. He was defeated in May 1999 by Ehud Barak. Benjamin Netanyahu press conference, 02/20/09. 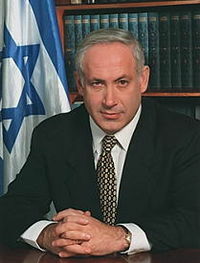 From 2003 through 2005 Netanyahu served as Finance Minister in the Ariel Sharon administration. He advocated policies that reduced government, strengthened the private sector, cut taxes, and privatized pensions. During his tenure unemployment dropped and the Israeli economy went from shrinking 1% to growing 4.2% in 2004. On February 10, 2009, legislative elections, the right-wing parties won a majority of seats in the Knesset, and they selected Netanyahu to serve a second term as Prime Minister. He was sworn in on March 13, 2009. Among other important pieces of legislation passed by Netanyahu's conservative coalition, in July 2018, the Knesset passed an amendment to the country's de facto constitution strengthening Israel's status as a Jewish state, proclaiming Jerusalem as the "united " capital of the country, and made Hebrew the country's official language, among other changes. His government has taken a strong stance against illegal immigration (see also: Border wall#Israel), and it moved to relax gun regulations. Netanyahu has taken Euroskeptic stances and has strengthened Israel's relationships with the conservative countries of Central Europe. Netanyahu faced a tough re-election campaign in 2019, and by that time, he had helped "transform" Israel, shifting it to the political Right. He became the apparent winner of the election, though coalition-building is the most important part of Israel's elections. Netanyahu has had very poor relations with the leftist U.S. president Barack Obama. During the very tight and closely-watched 2015 elections, the Obama Administration attempted to influence the election—in order to elect a leftist government in the nation and defeat Netanyahu—by financing a liberal Israeli political organization. Netanyahu decisively won the election, despite opposition from left-wing world leaders. On December 23, 2016, Obama broke over 35 years of American policy by abstaining from a UN vote and allowing a blatantly anti-Israel resolution to pass, showing his true stance concerning Israel. On December 28, 2016, just a few weeks before the Trump Administration was to take office and a few days after the leftist Obama Administration allowed an anti-Israel resolution to pass the UN and break decades of policy, Kerry gave a major 72-minute speech viciously attacking Israel and paying worthless lip-service to American "support" for the nation. Israeli Prime Minister Benjamin Netanyahu responded harshly but appropriately to the Administration's blatant betrayal. In response to the anti-Israel UN vote, Israel cut $6 million in its annual dues to the leftist organization on January 6, 2017. Despite the Obama Administration's actions, the U.S. House passed a motion on January 5, 2017 condemning Obama's allowing of the UN resolution. Additionally, Republican President-elect Donald Trump voiced strong support for Israel during this time. Netanyahu, who himself built a very successful wall along Israel's southern border with Egypt in 2013, endorsed U.S. President Donald Trump's plan to build a wall along the U.S. border with Mexico. Netanyahu thought highly of President Trump's foreign policy, as seen in statements he made that he thought were private but were being transmitted to reporters. On December 6, 2017, President Trump officially recognized Jerusalem as Israel's capital and ordered the U.S. State Department to begin the process of moving the U.S. Embassy from Tel Aviv to Jerusalem. On May 14, 2018, the U.S. officially moved its embassy in Israel to Jerusalem. Netanyahu praised President Trump for this decision and even compared him to Emperor Cyrus. In May 2018 Netanyahu thanked President Trump for his withdrawal from the Iran nuclear deal. On September 24, 2009 Prime Minister Netanyahu blasted Iranian President Mahmoud Ahmadinejad, a supporter of Islamic fundamentalism and is developing nuclear technology, possibly for nuclear weapons. The following is an excerpt from his speech. "Nearly 62 years ago, the United Nations recognized the right of the Jews, an ancient people 3,500 years-old, to a state of their own in their ancestral homeland. The United Nations was founded after the carnage of World War II and the horrors of the Holocaust. It was charged with preventing the recurrence of such horrendous events. Netanyahu and wife with Obama and Michelle at the Metropolitan Museum in New York, 2009. Nothing has undermined that central mission more than the systematic assault on the truth. Yesterday the President of Iran stood at this very podium, spewing his latest anti-Semitic rants. Just a few days earlier, he again claimed that the Holocaust is a lie. Yesterday, the man who calls the Holocaust a lie spoke from this podium. To those who refused to come here and to those who left this room in protest, I commend you. You stood up for moral clarity and you brought honor to your countries. A mere six decades after the Holocaust, you give legitimacy to a man who denies that the murder of six million Jews took place and pledges to wipe out the Jewish state. What a disgrace! What a mockery of the charter of the United Nations! Perhaps some of you think that this man and his odious regime threaten only the Jews. You're wrong. History has shown us time and again that what starts with attacks on the Jews eventually ends up engulfing many others. This Iranian regime is fueled by an extreme fundamentalism that burst onto the world scene three decades ago after lying dormant for centuries. In the past thirty years, this fanaticism has swept the globe with a murderous violence and cold-blooded impartiality in its choice of victims. It has callously slaughtered Moslems and Christians, Jews and Hindus, and many others. Though it is comprised of different offshoots, the adherents of this unforgiving creed seek to return humanity to medieval times. The most urgent challenge facing this body is to prevent the tyrants of Tehran from acquiring nuclear weapons. Are the member states of the United Nations up to that challenge? Will the international community confront a despotism that terrorizes its own people as they bravely stand up for freedom? Will it take action against the dictators who stole an election in broad daylight and gunned down Iranian protesters who died in the streets choking in their own blood? Will the international community thwart the world's most pernicious sponsors and practitioners of terrorism? Israeli settler leader: How Benjamin Netanyahu shaped today's Israel, by Oded Revivi, April 1, 2018. Danan, Deborah (July 19, 2018). Netanyahu Hails Jewish State Bill as ‘Pivotal Moment’ in Zionist History. Breitbart News. Retrieved July 21, 2018. Lubell, Maayan (July 18, 2018). Israel adopts divisive Jewish nation-state law. Reuters. Retrieved July 21, 2018. Zion, Ilan Ben (July 19, 2018). Israeli parliament passes contentious Jewish nation bill. Associated Press. Retrieved July 21, 2018. Hoffman, Gil (July 19, 2018). Controversial Jewish Nation-State Bill Passes into Law. The Jerusalem Post. Retrieved July 21, 2018. Lis, Jonathan; Landau, Noa (July 19, 2018). Israel Passes Controversial Jewish Nation-state Bill After Stormy Debate. Haaretz. Retrieved July 21, 2018. Byas, Steve (July 20, 2018). Israeli Communist Offers South Africa as Model for Israel After Passage of Controversial Nation-State Bill. The New American. Retrieved July 21, 2018. Danan, Deborah (August 12, 2018). Netanyahu: Palestinian Flags at Tel Aviv Protest Prove Need for Nation-State Law. Breitbart News. Retrieved August 12, 2018. ↑ Klein, Aaron (January 9, 2018). How to Successfully Stop Illegal Immigration: Follow Israel’s Model. Breitbart News. Retrieved January 9, 2018. ↑ Danan, Deborah (August 21, 2018). Hundreds of Thousands of Israelis Now Eligible to Carry Firearms. Breitbart News. Retrieved August 21, 2018. ↑ Deborah, Danan (July 9, 2018). Israel to Ease Gun Regulations. Breitbart News. Retrieved July 21, 2018. ↑ LISTEN: Netanyahu Caught on Hot Mic Blasting Europe’s ‘Crazy’ Policies on Israel. Breitbart News. July 19, 2017. Retrieved July 21, 2018. ↑ Kent, Simon (November 2, 2018). Netanyahu Rebukes ‘Hostile’ E.U. Ahead of Bulgaria Trip. Breitbart News. Retrieved November 2, 2018. ↑ Taylor, Guy (April 7, 2019). Gantz has chance of blocking Netanyahu's historic streak in election, pulling Israel toward center. The Washington Times. Retrieved April 7, 2019. ↑ Schwartz, Felicia (April 7, 2019). Israel’s Election Is Seen as a Referendum on Netanyahu in a Country He Helped Transform. The Wall Street Journal. Retrieved April 7, 2019. Murphy, James (April 10, 2019). Netanyahu Wins Israeli Snap Election. The New American. Retrieved April 10, 2019. Benjamin Netanyahu likely to win Israeli prime minister election after opposition party concedes. Fox News. April 10, 2019. Retrieved April 11, 2019. ↑ Klein, Aaron (July 13, 2016). Israeli Lawmakers Fume Over Obama Administration ‘Intervention’ to Defeat Netanyahu. Breitbart. Retrieved December 28, 2016. ↑ Netanyahu scores crushing victory in Israeli elections. The Times of Israel. March 18, 2015. Retrieved December 28, 2016. ↑ Israel fears Obama will strike again. World Israel News. December 26, 2016. Retrieved December 26, 2016. ↑ Berkowitz, Adam Eliyahu (December 26, 2016). Fed Up With United States Trickery, Netanyahu Takes Drastic Actions. Breaking Israel News. Retrieved December 26, 2016. ↑ Hanchett, Ian (December 28, 2016). NBC’s Neely: Kerry Speech ‘Firing a Flare’ ‘Across Israel’ He Wanted To Give It ‘For Some Time’ But WH Blocked It. Breitbart. Retrieved December 28, 2016. ↑ Pollak, Joel B. (December 28, 2016). Kerry Attacks Israeli Government, Defends UN Resolution. Breitbart. Retrieved December 28, 2016. ↑ Key, Pam (December 28, 2016). Netanyahu: ‘I Must Express My Deep Disappointment’ With Kerry — ‘Israelis Do Not Need To Be Lectured’. Breitbart. Retrieved December 28, 2016. ↑ Israel halts $6 million to UN to protest UN settlements vote. Fox News (from the Associated Press). January 6, 2017. Retrieved January 7, 2017. ↑ House overwhelmingly votes to condemn UN resolution on Israel settlements. Fox News. January 5, 2017. Retrieved January 6, 2017. ↑ Cortellessa, Eric (January 6, 2017). US House passes motion repudiating UN resolution on Israel. The Times of Israel. Retrieved January 6, 2017. ↑ Pollak, Joel B. (December 23, 2016). Trump on UN Anti-Israel Vote: ‘Things Will Be Different After Jan. 20’. Breitbart. Retrieved January 6, 2017. ↑ Swoyer, Alex (December 29, 2016). Trump: ‘I’m Very, Very Strong on Israel’. Breitbart. Retrieved January 6, 2017. ↑ Weber, Joseph (January 28, 2017). Netanyahu backs Trump's Mexico wall, touts similar one on Egypt border as 'great idea'. Fox News. Retrieved January 30, 2017. ↑ LISTEN: Netanyahu Caught on Hot Mic Blasting Europe’s ‘Crazy’ Policies on Israel. Breitbart News. July 19, 2017. Retrieved July 19, 2017. Boyer, Dave (December 6, 2017). Trump’s recognition of Jerusalem as Israeli capital fulfills campaign promise broken by predecessors. The Washington Times. Retrieved December 6, 2017. Holland, Steve; Lubell, Maayan (December 6, 2017). Trump recognizes Jerusalem as Israel's capital, reversing longtime U.S. policy. Reuters. Retrieved December 6, 2017. Pappas, Alex (December 6, 2017). Trump officially recognizes Jerusalem as Israel's capital, orders embassy move for US. Fox News. Retrieved December 6, 2017. Pollak, Joel B. (December 6, 2017). Trump: ‘I Have Determined That It Is Time to Officially Recognize Jerusalem as the Capital of Israel’. Breitbart News. Retrieved December 6, 2017. Byas, Steve (December 6, 2017). Trump Respects Israel’s Sovereignty in Embassy Move to Jerusalem. The New American. Retrieved December 16, 2017. Singman, Brooke; Berger, Judson (May 14, 2018). US opens embassy in Jerusalem, recognizing city as ‘true capital’ of Israel. Fox News. Retrieved May 14, 2018. Spiering, Charlie (May 14, 2018). Donald Trump Officially Opens U.S. Embassy in ‘Historic and Sacred Land of Jerusalem’. Breitbart News. Retrieved May 14, 2018. Pollak, Joel B. (May 15, 2018). Jerusalem Embassy Opening: A Ray of Light. Breitbart News. Retrieved May 15, 2018. ↑ Silow-Carroll, Andrew (March 8, 2018). Who is King Cyrus, and why did Netanyahu compare him to Trump?. Times of Israel. Retrieved August 30, 2018. ↑ (Keinon, Herb). NETANYAHU APPLAUDS TRUMP’S ‘BRAVE DECISION’ TO PULL OUT OF IRAN DEAL. Jerusalem Post. Retrieved September 2, 2018. This page was last modified on 11 April 2019, at 07:40. This page has been accessed 35,754 times.